He had to ask, because he couldn’t see her. 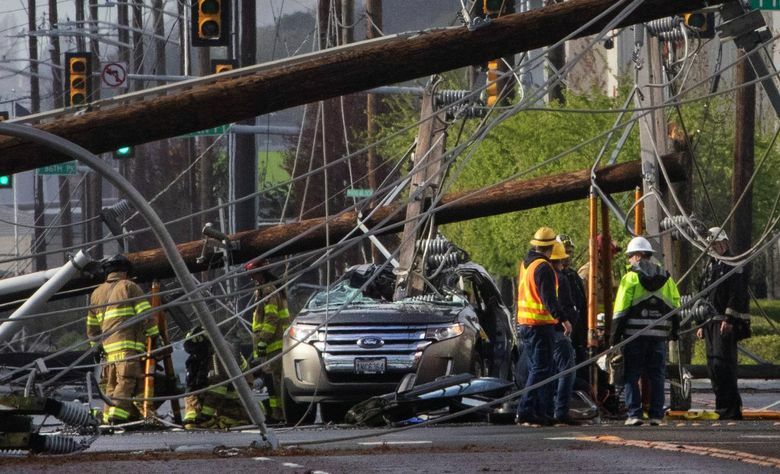 The wooden power pole, one of 26 that collapsed along East Marginal Way on Friday shortly before 4 p.m., fell between them, blocking their view of one another. Linda Cook, his wife of 31 years, joked back: “Well, I don’t think we’re gonna trade this car in.” They had one more year on the lease. Despite the 71-year-old’s characteristic humor, the fear was real, the situation still dangerous. All she could see was her husband’s bleeding right hand as it rested on the console. To assess their injuries, she wiggled her toes and fingers and told her husband to do the same. From across the pole, Tom Cook, 67, felt blood on his head. As of Sunday afternoon, it was still unclear what had caused the poles to fall. City Light officials said the poles passed full inspection three years ago. Some had even been replaced in 2016. The Cooks were in good spirits as they recounted the accident while recovering in their SeaTac home. They still didn’t know where their car was. They had left a message with the police hoping to find out so they could collect some of their belongings from the car, but they had yet to hear back. For the couple, Friday had been just like any other. In the afternoon, they made their way to the airport to spot planes, one of Tom Cook’s favorite hobbies. Since 1979, Tom Cook has tracked business jets — in the hopes of spotting one he hasn’t yet seen. So far, he’s seen about 13,000 different planes. A secretary at Boeing before retiring, his wife accompanies him on the daily expedition. ‘They all know us at the airport Starbucks,” Linda Cook said. On Friday, their routine trip came to a halt when they heard a boom and saw a flash. Then, the pole hit. After checking on his wife, Tom Cook attempted to leave the car when a bystander shouted for him to stop because the collapse left some live wires on the ground. The couple waited in the car for an hour while first responders worked to shut the power. From the sidewalk, a firefighter did his best to determine the couple’s condition, asking how they felt with a thumbs up and down. “I didn’t feel safe until I got out of the damn car, because I couldn’t see my husband,” Linda Cook said. The couple’s children learned about the accident from a dispatcher. Tom and Linda’s granddaughter was supposed to be in the car with them and would have been sitting in the middle in the back seat — in the path of the pole. All were grateful that she had chosen to go to a movie instead. After that first alert, the Cooks’ children watched live coverage as first responders freed their mother, then their father, and took them to Harborview Medical Center. Tom Cook got there later, because the responders had to remove the driver’s-side door and extract him on a backboard. Both sustained bruises. 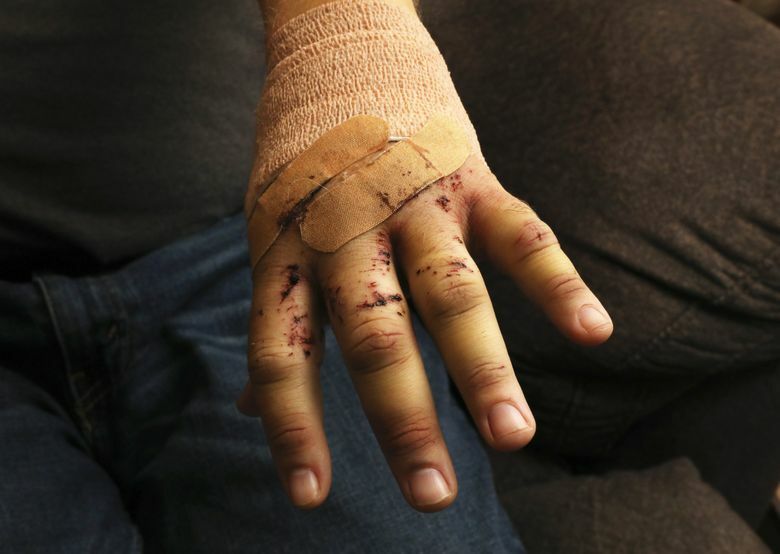 Tom Cook’s hand needed five stitches. 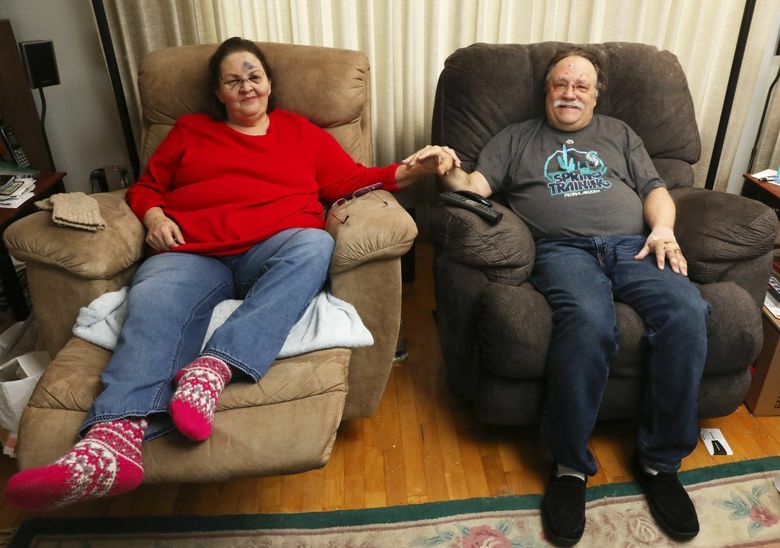 It wasn’t until after 10 p.m. that the couple finally returned home, where they sat down exhausted. After reflecting on their routine airport trips, Linda Cook slipped easily into the story of how the two saw each other in person for the first time at the Philadelphia International Airport where Tom Cook used to watch planes with his parents as a child. She thought: “Two out of three ain’t bad!” They continued an online correspondence, then Tom Cook sent her a ticket to Philadelphia. Three months later, they married. “He is my best friend and has been for 31 years,” she said. 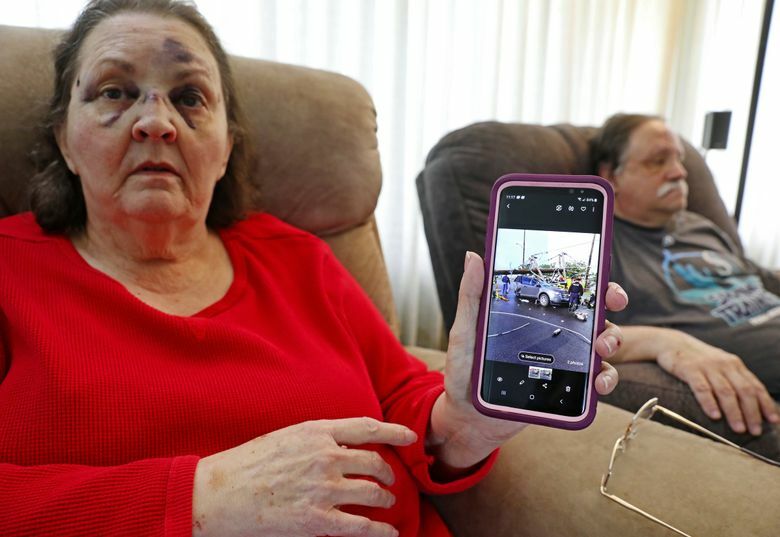 After the excitement of this weekend, Linda Cook said they both feel lucky: If the pole had hit their car just a few inches in either direction, one of them might have died. Others seemed to find their story magical as well. According to Linda Cook, one of the cameramen who interviewed her Saturday rubbed her sleeve for good luck. “Humor seems the best way to go about it, because otherwise I’d be a basket case,” said Linda Cook. They appreciate the words and best wishes they’ve received from all over the country. “For our 15 minutes of fame, we’d really rather have been accepting a big lottery check,” Linda Cook said. 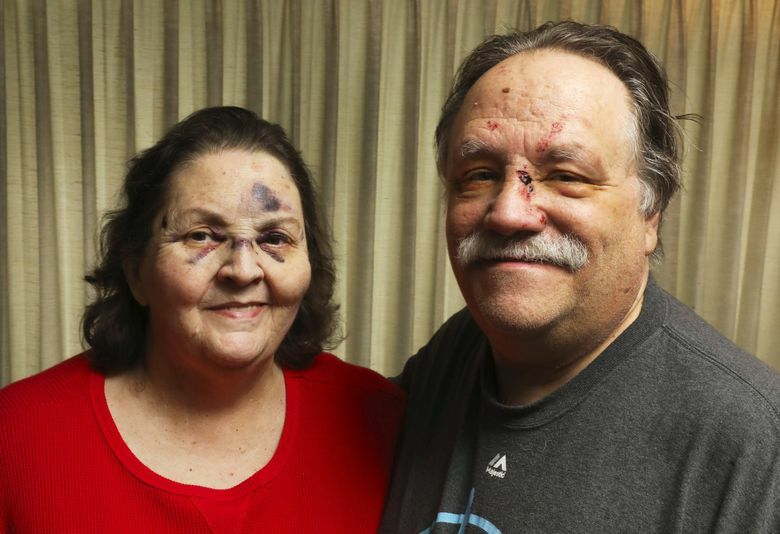 While Linda Cook is retired, Tom Cook will return to his job as a warehouse manager for a salmon canning company as soon as his glasses — shattered in the accident — are repaired. Linda Cook said she isn’t sure what they’ll do when they recover.